Analyzing the voting that took place throughout Russia on March 13 was like going to the theater to see bored actors performing a story everyone already knows. The election system in Russia has certain features that make it different from its analogs in other countries. In many places around the world, the activities preceding Election Day are tightly regulated and consist of a series of mundane and even outright boring events. Yet, the results of the elections are often unpredictable. In contrast, in Russia the outcome of elections is usually known in advance. It is the election campaign period that is always filled with colorful and sometimes completely unanticipated occurrences. Promises of violence naturally resulted in action. The leader of Just Russia, Sergei Mironov, got away lightly—he was attacked only with a pillow. LDPR’s Cyril Cherkasov was not so fortunate: He had a bag of rotten eggs thrown at his head. Then, the violence became real. In Arzamas, a fistfight erupted between campaign workers representing KPRF and the United Russia party. In Perm, brass knuckles and sticks were used to beat up 10 United Russia activists, one of them a young woman. Closer to election day, the very foundation of modern science was shaken. In 12 draws that were held to determine the order of the parties on the printed ballots in each regional election, United Russia – in a remarkable defiance of the probability theory – won six (!) first places. The election day itself finally put an end to all the intrigues of the campaign season. The results were pretty much as expected: The ruling United Russia party won the majority in all 12 party-list contests and—aided by the traditionally strong performance of its single-mandate candidates—came away with a combined total of 68 percent of the seats in regional legislatures. The Communists came in second with 13 percent of the seats, Just Russia with 9 percent, and the LDPR with 6 percent. Among parties currently not represented in the State Duma, unexpectedly strong results gave the well-organized Party of Russia’s Patriots seats in two regional parliaments. The success of the Patriots is especially impressive given that they competed for the same voters as the major opposition party in the Duma, KPRF. Equally predictable were interpretations of the election results presented by different political players. The opposition called United Russia’s performance “disastrous,” pointing that on Mar. 13, the party polled less than in the 2007 Duma elections and even less than in the previous round of regional elections held in October. United Russia shot back, arguing that the dynamics of the federal and regional elections is so different that any comparisons between them make little sense. Besides, each Russian region has its own sets of unique electoral issues, rendering any “inter-regional” matching largely meaningless. United Russia also drew attention to the fact that the average vote in all 12 regions (50 percent) was higher than the one received by the party in the same regions four years ago (43 percent). Moreover, this increase came against the background of the higher (by 5-7 percent) voter turnout. The last fact deserves some reflection. 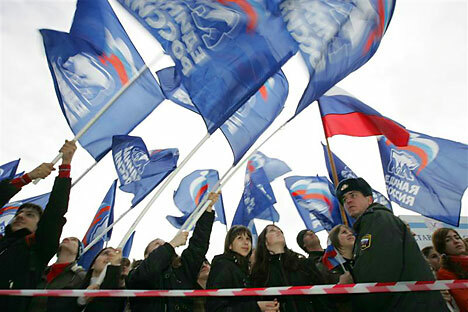 United Russia’s critics, especially among the Communists, have long maintained that higher voter participation would erode United Russia’s support. The idea behind this assertion is that rising prices for food and communal services are creating a strong undercurrent of protest in society. The critics argued that this dissatisfaction would cause new voters to cast their ballots against the party of power. The results of the Mar. 13 elections, however, have produced no evidence in support of this idea: United Russia seems to have captured the majority of new voters as well. Many Russian analysts and media people predictable dubbed the Mar. 13 elections a dress rehearsal for this year’s State Duma election. It’s difficult to agree with such a comparison. None of the seven political parties participating in the elections, including United Russia, has articulated a program for appealing to the voters or employed an innovative campaign strategy. Far from being a dress rehearsal, the past elections seemed more like a familiar play performed for the 100th time by bored actors whose only motivation is a pay check and the iron fist of the stage director. Besides, the upcoming performance named the December Duma election hardly needs a rehearsal, for its outcome is already known to everyone: United Russia will win a majority. The only intrigue that seems to still exist is whether United Russia will be able to form the constitutional majority it enjoys in the current Duma. Some cynics suggest, however, that this intrigue will be resolved not at the ballot box, but by the Kremlin. The fact that the Mar. 13 regional elections were dirty, unfair or predetermined in advance is not perhaps their most troubling aspect. The real issue is that they have yet again demonstrated that the Russian political system is completely outdated. Created in different times, under different circumstances and to serve different purposes, today it is seemingly incapable of addressing Russia’s most important problem: creating conditions to support the political, economic and social modernization of the country. With public confidence in the Duma and political parties at record lows, Russian elites are busy with things that have little in common with the lives of ordinary citizens. Or, continuing on the theater theme, Russian politicians are like actors performing a play that the spectators do not understand. It is only a matter of time that the crowd begins leaving the performance hall.